When it comes to Halloween candy, you can have too much of a good thing. Take this scary statistic: According to a Foodbeast article, the average person eats 3.5 pounds of candy during the Halloween season. That’s a whole lot of candy corns and mini-chocolate bars! Are you expecting trick-or-treat overload? Manage your Halloween haul with these tips for sharing, saving and repurposing your sweets. Operation Gratitude’s Halloween Candy Buy Back is in full swing! Through this program, kids from around the country can “sell” their Halloween candy to participating dentists in their local area. The dentists “buy” the candy by giving the children something in exchange like toothbrushes, money, or special prizes. The candy is then sent to the non-profit organization Operation Gratitude and delivered in care packages to deployed U.S. soldiers, sailors, airmen and marines around the world. In 2015, 580,000 lbs. of candy were donated! Visit HalloweenCandyBuyback.com to find a buyback location near you. 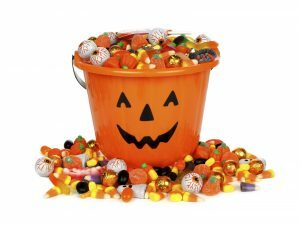 Contact a local senior center or nursing home and see if you can share your candy with the residents. Put together little treat bags (buy them at after-Halloween sales), and have your children surprise the seniors with some goodies. People are never too old for a sweet treat, and children are never too young to learn about giving. There are so many creative ways you can incorporate Halloween candy into recipes. How about Starburst candy shot glasses, cookies, Crazy Halloween Blondies, or Halloween bark? Add candy to trail mix or blend in a milkshake. And of course you can always make an ice cream sundae extraordinaire loaded with terrific candy toppings. Move those chicken nuggets over and make room for chocolate. Many people don’t realize that you can store candy in the freezer and it should stay fresh for months. Visit The Balance for guidelines on how long you can store candy. Turn trash into trendy accessories. Discard the candy and use the wrappers to make fun hair bows, purses, bracelets, belts and more. Use your imagination and get crafty. If there is a birthday party in the near future, put the candy aside and you’ll have a stockpile of filler ready to go. Can a Lifesaver light up? Does a chocolate bar float? Find out for yourself by transforming your kitchen into a laboratory with candy experiments! This is a super fun way to learn about science. Visit the Candy Experiments website for 100+ exciting ideas that introduce kids to topics like density, acids, carbon dioxide, color, temperature and more. The fall version of Elf on the Shelf, the Switch Witch encourages children to leave out candy for the witch on Halloween night. (The witches need candy to create potions of course.) The Switch Witch will take the candy and leave a toy or other gift in its place. If the thought of too much Halloween candy is driving you batty, take action with these easy tips. Have fun and Happy Halloween!